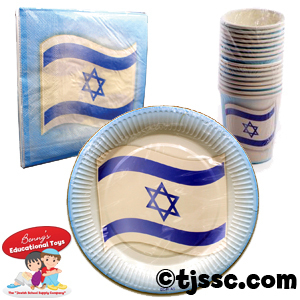 Israeli independence day ("Yom HaAtzmaut" in Hebrew) items for Jewish schools and Jewish organizations. This section includes Israeli flags, Atzmaut arts & crafts, stickers, posters and learning materials. You will also find a huge selection of Israeli independence day party favors, as Israeli flag inflatables and lapel pins. Take a look at ot our variety of our affordable and great quality Israel party hats and flags - Great for "Salute Israel" parades or events. This year Israel celebrates 70 years of independence. We gathered many new 70 years Israel anniversary related items for you. 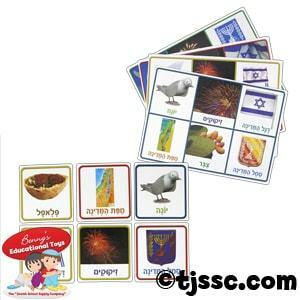 We offer a wide range of Israel Atzmaut arts and craft project ideas, including many that are 70 jubilee specific. We also added more Israel solidarity parade novelties such as Israel party hats, Israel flag scarves, 70 years Israel LED glasses and even cool Israeli flag bandanas! All at bulk quantity discounts for synagogues, Temples, Jewish centers and organizations.